Providing both swift installation and a realistic slate-effect, SlateSkin is the latest enhancement Eurocell has developed for Equinox, its innovative tiled conservatory roof system. Together, SlateSkin and Equinox create the most advanced system currently available with an AA* fire rating. With multiple tile courses built in to each sheet, the SlateSkin GRP tile system reduces the time spent positioning and nailing tiles, with no compromise on build quality or aesthetics. SlateSkin has fewer gaps than separate tiles to prevent any moisture getting into the roof space causing condensation. Its lightweight construction allows the pitch to be set anywhere from 50 – a pitch that no other current tile system can currently achieve – to 350; making SlateSkin is ideal for a wide range of conservatory styles including lean-to's and makes light work of roofing with less carrying and handling required. 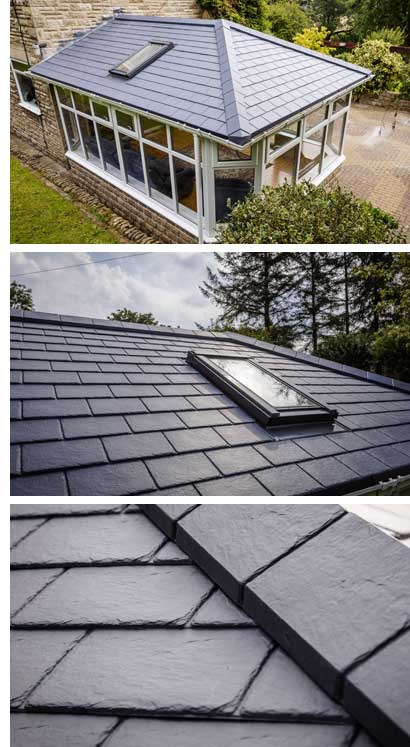 Guaranteed for 25 years, the SlateSkin sheet-tiling system is not only durable but up to 50% faster to fit than other traditional conservatory tile roofing methods and, when part of an Equinox system, it achieved a fire rating of EXT AA* when tested to BS 476 Part 3:2004 for the External Fire Performance of Roofs. Supported by the Eurocell technical department, installers can be sure of getting the right fit first time, every time. Once they have received all the dimensions, the company’s engineers will create all the components required, including the tile sheets, hip end caps and ridge and hip top cap using state-of-the-art equipment. SlateSkin is just the latest complementary product developed for the Equinox roofing system, which features solid insulation panels integrated in the structure for superb thermal efficiency – approximately ten times better than an ‘A’ rated window. The result is a more comfortable living environment that costs less to heat or cool because it is insulated from the ambient temperatures outside, making it warmer in winter and cooler in summer. Advanced design features make Equinox simpler and faster to install. A three-man installation team can complete an Equinox tiled roof in just two days, and it will be watertight on day one, so it can be safely left overnight. The system’s 50 to 350 pitch variable ring beam assembly increases the types of roofs that can be replaced while adjustable angles on the hip, valley and ridge add up to easier fitting, and ensure that tiles and ridges sit correctly for finishing. All rafters sit flush with the hip and rafter too, providing greater strength. Thermal breaks avoid moisture build up, and air gaps within the roof allow any moisture to dissipate quickly – so there is no danger of internal condensation, unlike some tiled roof systems. Equinox kits offer a ‘one box solution’ – with SlateSkin sheets pre-cut to size and numbered for easy identification and installation. Plus, all the sealants and fixings required to install the roof to the highest standard are also in the box. To find out more about StaleSkin call us today on 0300 333 6525 or visit our SlateSkin pages here.